Ah yes! 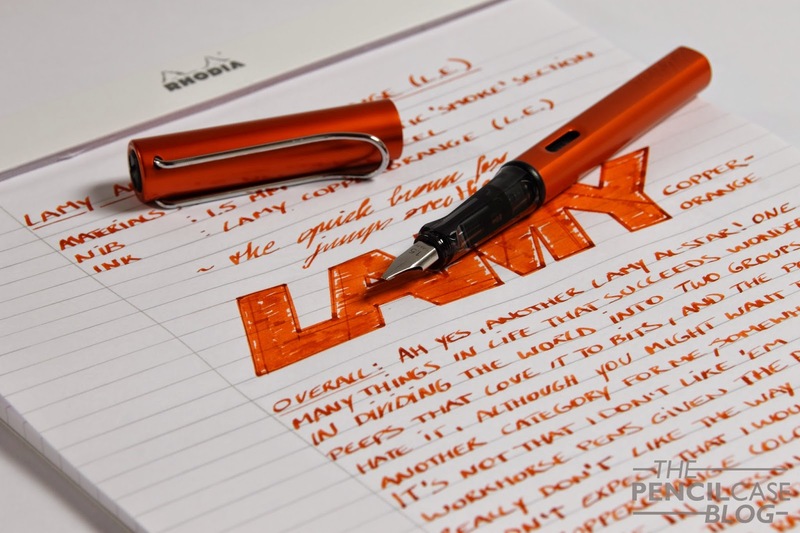 Another Lamy Al-star! One of many things in life that succeeds perfectly in dividing the world into two groups: the peeps that love it to bits, and the ones that absolutely hate it. Although you might want to add a third group for the people like me, somewhere in between the love and hate! It's not that I don't like these pens. In fact, to be honest, this is probably the kind of pen I use most of the time. But there's a difference between using it and loving it I think. They're great pens for what they do, but as far as looks go, I'm not a huge fan. Orange this bright really doesn't hide that well! 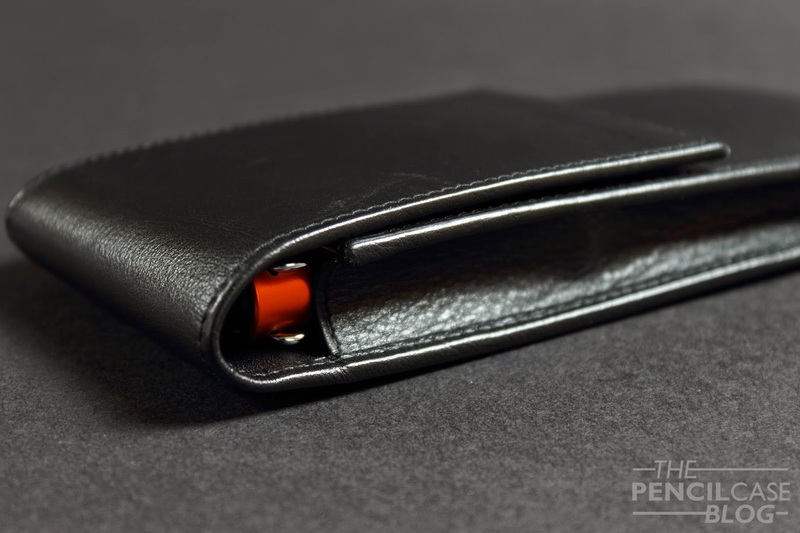 That's why I also didn't expect myself to like this new copperorange color, the limited edition for 2015. I'm not that fond of bright colors anyway, so it felt like a lost cause... But now that I used it in real life, I actually quite like it! Especially when paired with the new copperorange cartridges, this thing is pretty cool. In real life, the orange color is vivid and bright, yet slightly less than what you see on the pictures. My camera picked it up like this, and even after bringing the saturation down, it still appears slightly brighter than it actually is. 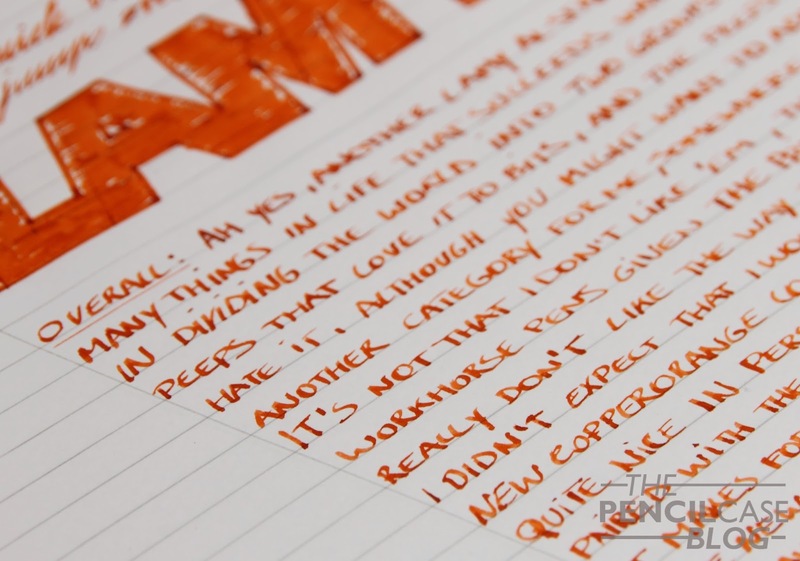 It's a bright pen, don't get me wrong, but I actually quite like the not-so-punch-in-the-face kind of orange they used on this one. 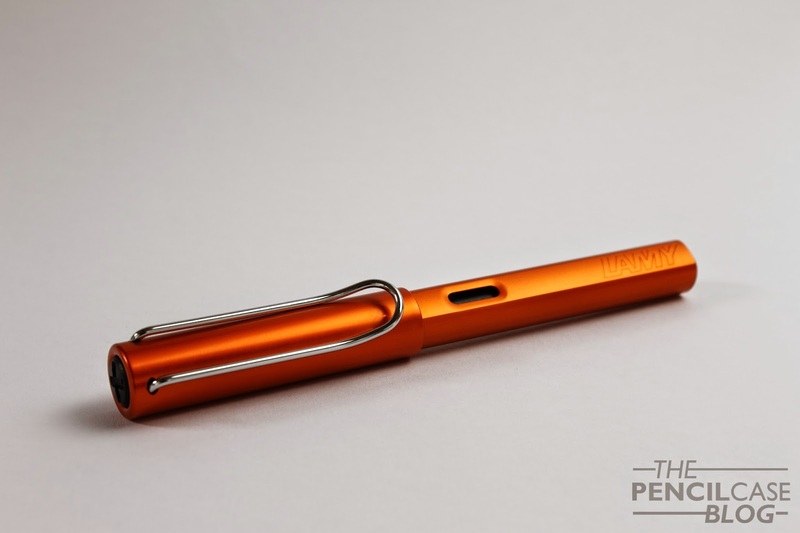 I don't know if copperorange is an actual color, but the name does a good job at describing what this pen looks like. 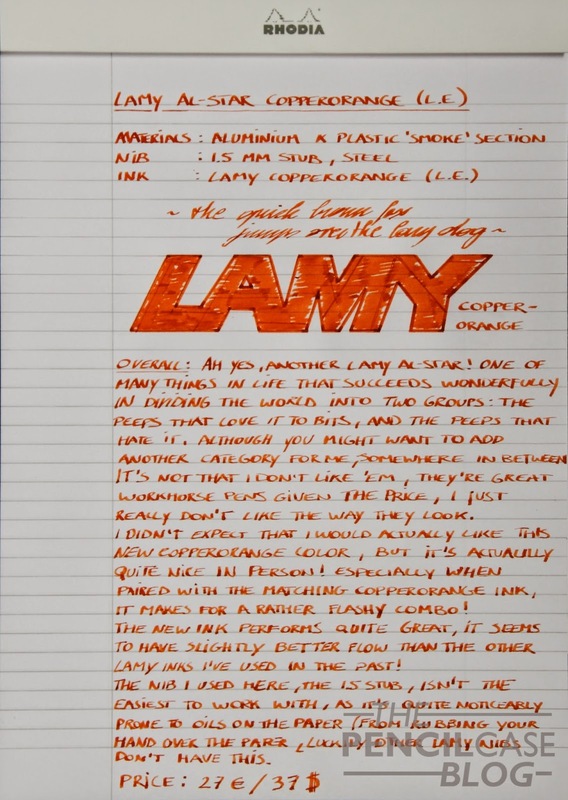 The ink color is also pretty much spot-on, and it's a nice ink to use (I'd even dare to say it's slightly better than the bottled inks I have from lamy, it behaves slightly better). The pre-formed grip section is probably the biggest gripe of most people, and it's definitely something you have to get used to when using one of these for the first time. 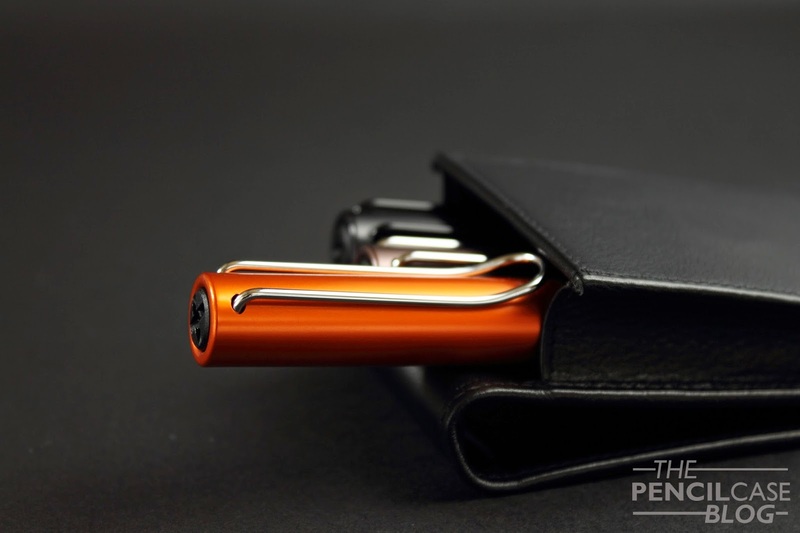 It can be considered a downside for some, but at the other hand, this pen is directed towards beginner fountain pen users, who will definitely benefit from having a certain 'guide' on how to hold the pen while writing. I popped in my trusty 1.5mm stub nib to get the most out of the ink, and just because I like the calligraphy nibs Lamy makes. However I did notice that it is especially sensitive to oils on the paper; When you write, the oils on your hand transfer to the paper underneath, which can cause lesser performance with some pens. And this nib is definitely one of those pens that struggle with it. Unfortunately I only have a box of copperorange cartridges, I wouldn't mind a bottle of this stuf! Other than that, it's still a great performer. 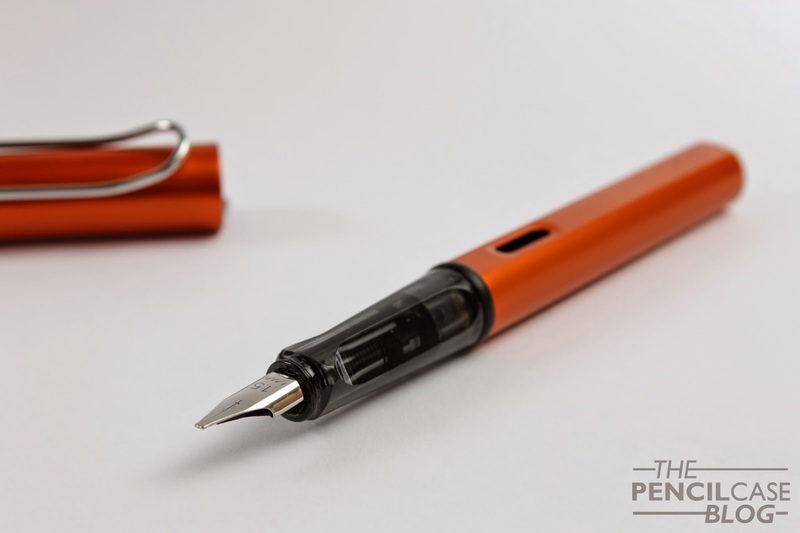 Give it a fine or medium nib, and the performance of the pen is much more consistent. It has a steady, normal flow, and the steel nibs from lamy are quite smooth, though with a hint of feedback. In for a bright pen? Then this limited edition Copperorange Al-Star won't dissapoint. 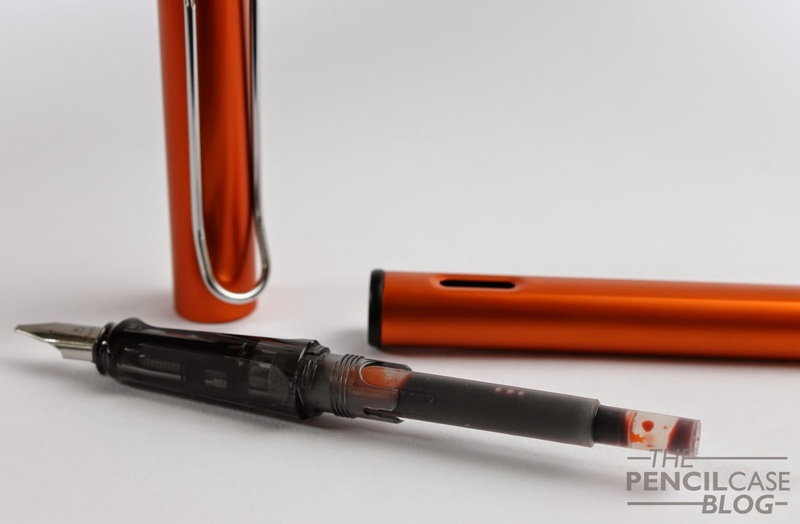 The Al-Star is a solid step up from the regular Lamy safari, while remaining very affordable, at 27 EUR / 38 USD. At that price point, it's pretty much a no-brainer, even if you're not a huge fan of that strange grip section. I'd also make sure to pick up some of the Copperorange ink cartridges while you're at it, which makes for a great pen and ink combo! I'd also like to take some time to thank the great folks over at Penworld. Not only did they provide this pen for review, they also included a second pen and box of matching cartridges that I'll be giving away! 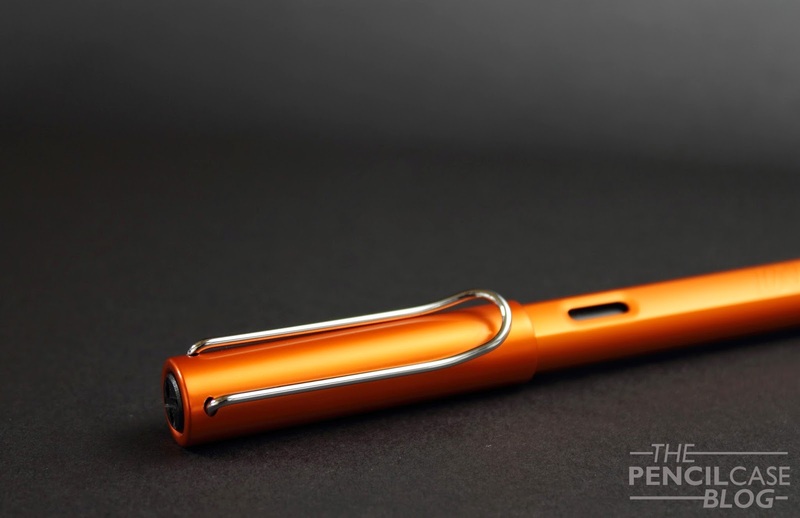 If you're interested in winning a Lamy Al-Star Copperorange and matching ink cartridges, make sure to check out the giveaway here! 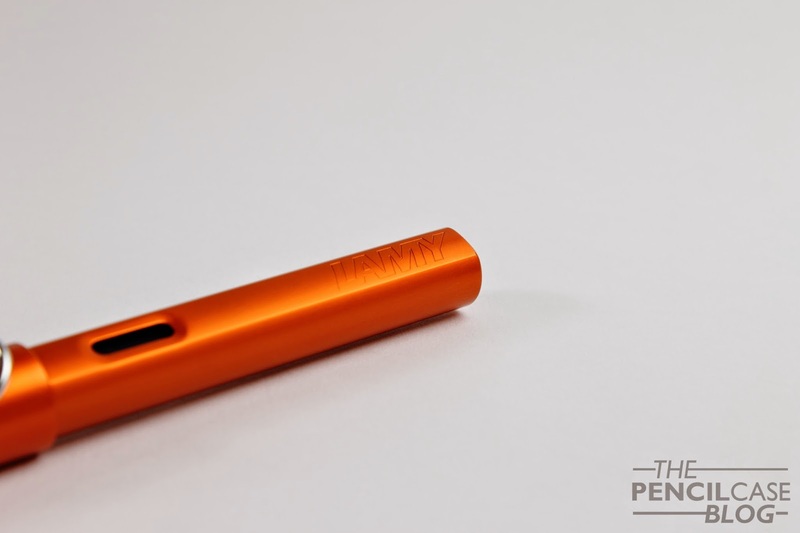 Note: this pen was sent to me by Penworld, so I could write this review. I was in no way influenced in the making of this review, nor was I monetarily compensated. The opinions shared in this review are completely my own!